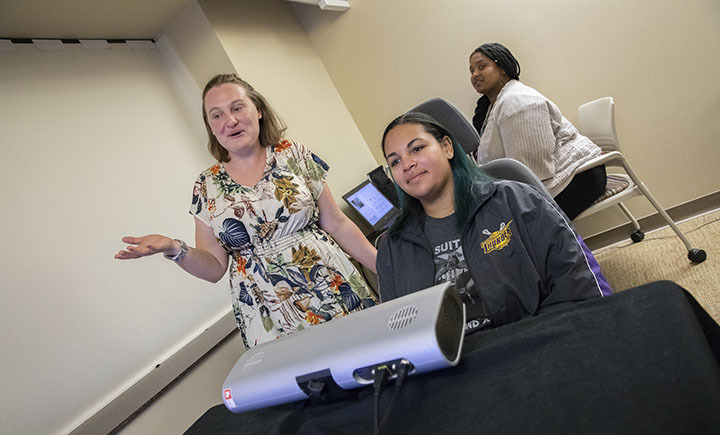 For LSAMP student Taylor Hitchcock, LSAMP summer research is bringing her closer to her goal of working in pharmacology and providing an opportunity to teach about deaf etiquette in the Binghamton community. Emily Blakaley, a graduate student studying under Professor of Psychology Peter Gerhardstein, with Taylor Hitchcock (center) and Carlye Jones (right), a Bridges to the Baccalaureate Program scholar. That may not be the first thing you expect someone to say, but for Taylor Hitchcock, she swears that becoming deaf was the key to finding herself and her confidence. Hitchcock is a student at Monroe Community College in Rochester, but she has spent her summer at Binghamton University as part of the Louis Stokes Alliance for Minority Participation (LSAMP) summer research program. Hitchcock started her research at Binghamton last summer as part of the Bridges to Baccalaureate program. She works with Professor Peter Gerhardstein from the Psychology Department on research related to the visual development of young children. 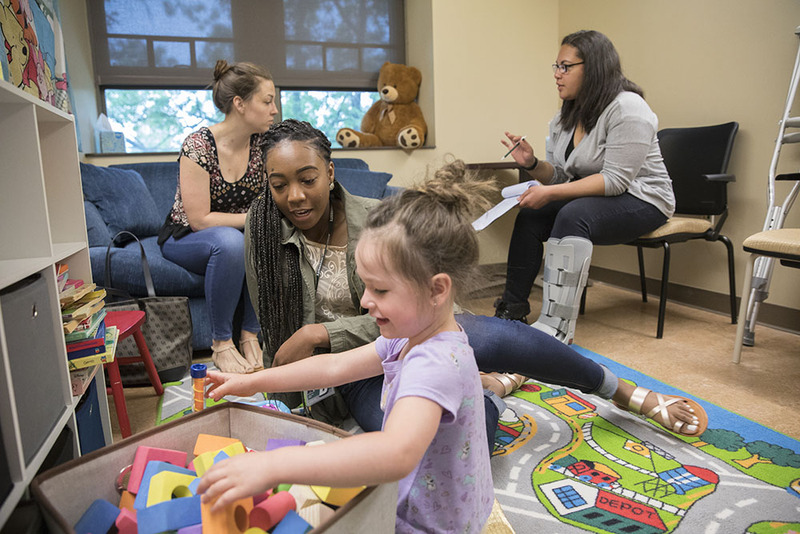 Taylor Hitchcock (right) in summer 2017 working as part of Bridges to the Baccalaureate program with transfer student Jazlynn Gray with children and their mothers in Peter Gerhardstein's lab. Last summer, Hitchcock worked on similar research that tested how kids would react to varied rewards. While working on a summer research project is hard enough, Hitchcock also had an added challenge. “I’m the first deaf student to participate in these Binghamton programs, so I’ve definitely had to teach deaf etiquette to a few people,” explained Hitchcock. She went deaf about two years ago and has since learned quite a bit about the nuances in how the deaf community is treated. Hitchcock also said that reading lips is more complicated than one might assume. Hitchcock’s relationship with her interpreter is an important one and one that she said others can take for granted. “I have a team of about five different interpreters that I work with when I’m at Binghamton. It’s like having your cell phone always with you. It’s the way you communicate with the world but that’s also a person that you bond with. “How people treat their interpreters definitely varies across generations though. I’ve noticed that really old people will be so appreciative of interpreters because they didn’t have that when they were younger. Middle-aged people tend to expect that everyone learns sign language. Younger people will sometimes blame interpreters for things. After becoming deaf, Hitchcock said that her social anxiety dissipated. As for what Hitchcock plans to do once she graduates, she said she is deciding between psychopharmacology and working in pharmacology for exotic animals.